I'm not a banana pudding expert, I'm not even really a banana fan, but somehow I ended up hearing someone talk about how banana pudding isn't actually banana flavored pudding, it's vanilla pudding with banana slices and Nilla wafers in it and anyone who uses banana flavored pudding is doing it all wrong. That was about a month ago and apparently it's been sitting on the back-burner of my brain because the other day I was just walking down the street and it hit me. 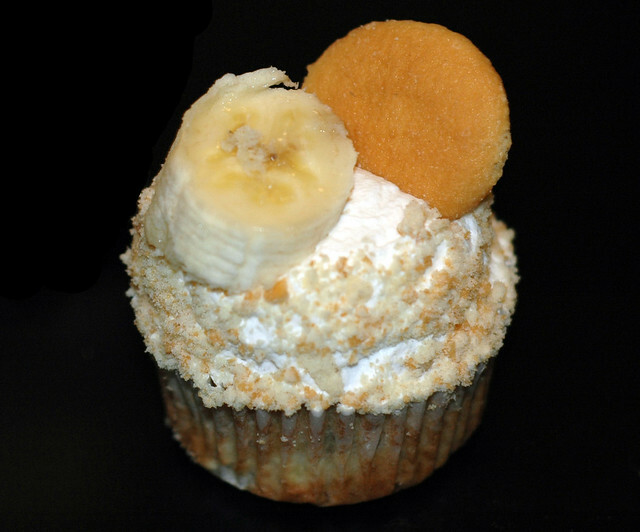 A banana cupcake filled with vanilla bean pudding with whipped cream on top, rolled in Nilla wafer crumbs, and topped with a banana slice. I wrote my idea down so I wouldn't forget it, gathered some recipes to use, and came up with this cupcake! Place milk in a medium, heavy saucepan. Scrape vanilla bean seeds; add seeds and bean to milk. Bring to a boil over medium-high heat. Combine sugar, cornstarch, and salt in a large bowl, stirring well. In a liquid measuring cup, whisk together half-and-half and egg yolks. Pour into the sugar mixture until combined. Gradually add half of the boiling milk mixture to sugar mixture, stirring constantly with a whisk so you don't cook the eggs. Pour the egg and milk mixture back into the saucepan and return to heat; bring to a boil and cook for 1 minute, stirring constantly with a whisk. Remove from heat. Add butter, stirring until melted. Place a fine mesh strainer over a bowl and strain the pudding to get out any lumps and discard the vanilla bean pod. Place bowl in a large ice-filled bowl for 15 minutes to help it cool, stirring occasionally. Cover the surface of the pudding with plastic wrap and chill in the fridge for 2 hours or until set up. Preheat oven to 350°F. Line a muffin tin with paper liners and place a Nilla wafer in the bottom of each liner. Sift and whisk together flour, sugar, baking powder, baking soda, and salt. Make a well in the dry ingredients and mix in butter, mashed bananas, eggs, and vanilla. Stir to incorporate wet and dry ingredients being very careful not to overmix. Fill each cupcake liner 2/3 full and bake for about 20 minutes, or until a toothpick inserted in the center comes out clean. Let cool completely on a wire rack before filling and frosting. In a large bowl or stand mixer, whip heavy cream until stiff peaks are about to form. Add the vanilla and confectioners’ sugar and continue whipping until peaks form and you reach desired consistency. Use a knife to cut a hole in the top of the cupcakes. Spoon pudding into the hole and cover the top with whipped cream, nilla wafer crumbs, and a banana slice. Feel free to snack on the leftover cupcake centers!